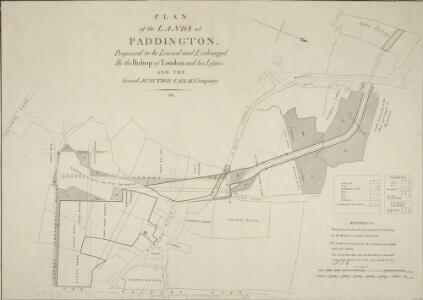 PLAN of the LANDS at PADDINGTON Proposed to be Leased and Exchanged by the Bishop of London and his Lessees AND THE Grand JUNCTION CANAL Company. 1 : 3168 Paddington was a predominantly rural area until the end of the 18th century.The Bishop of London granted the Grand Junction Canal Company permission to extend the canal from Brentford to Paddington.The Paddington Estate Act also allowed developers to start building on the estate.The title of this plan appears at top left. A reference table at bottom right gives a key to hatching and the dimensions of lots that formed part of the lease and exchange between the bishop and the canal company. Cary, J. Description: Paddington was a predominantly rural area until the end of the 18th century.The Bishop of London granted the Grand Junction Canal Company permission to extend the canal from Brentford to Paddington.The Paddington Estate Act also allowed developers to start building on the estate.The title of this plan appears at top left. A reference table at bottom right gives a key to hatching and the dimensions of lots that formed part of the lease and exchange between the bishop and the canal company.